Two years ago, the Oakland, California, School Board decided to require teachers to acknowledge the vernacular of their African-American students, sparking a national debate over whether African-American speech should be viewed as a distinct language. 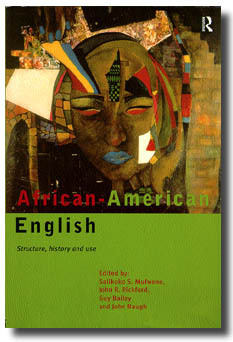 African-American English: Structure, History, and Use (Routledge), released in April, represents the contributions of Salikoko S. Mufwene, PhD’79, the chair of the U of C linguistics department, and three other language scholars to this ongoing discussion. The editors compare the vernacular not to standard English but to other variations, such as Appalachian English and Ozark English, because of their concurrent development and common syntactic features, challenging linguists to look harder at the role played by social factors in its construction. An international group of researchers, including associate professor of geophysical sciences David Rowley, reported in the March 12 issue of Nature that a crater chain strung across two continents suggests that a fragmented comet crashed into Earth over a few short periods of time some 214 million years ago, resulting in a mass extinction of most of the planet’s plant and animal life. Three of the five craters—the Rochechouart in France and the Manicouagan and the Saint Martin in Canada—were at a northern latitude of 22.8 degrees, forming a nearly 5,000-kilometer-long chain. The other two—the Obolon in Ukraine and the Red Wing in Minnesota—line up with the Rochechouart and the Saint Martin craters, respectively. Though all of the craters had been well-studied, their alignment had never before been identified. Rowley puts the chance of the band being formed randomly at zero. How can the analects of Confucius, the dialogues of Plato, the poetry of Yeats, and other classic texts possibly be applied in today’s world? According to humanities professor Herman Sinaiko, AB’47, PhD’61, such works can help modern readers explore the human condition, deepening their understanding of themselves and the world around them. In Reclaiming the Canon: Essays on Philosophy, Poetry, and History, published in April by Yale, Sinaiko draws on decades of teaching to illuminate what he believes can still be learned from the Iliad, Anna Karenina, and other masterpieces spanning the past 25 centuries.